A friend asked me to make an amigurumi specifically for his new born son and I thought since I’m starting from scratch I’d share my design process. A little step by step if you wanted to call it so .. 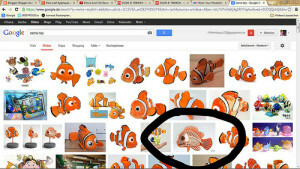 He wants a “finding Nemo” doll with the short fin. His son was born with one hand a little shorter than normal. But overall his son is all healthy and a super cutie! 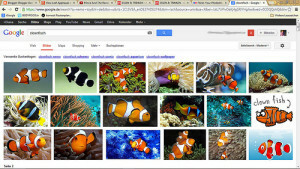 I always start with a google picture search .. 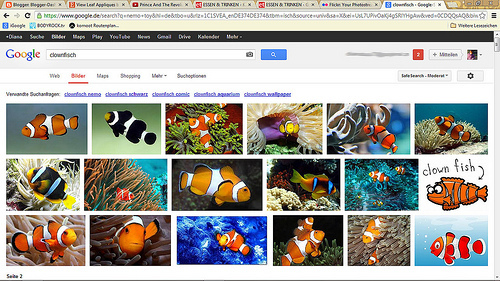 I search for the original animal, in this case a clown fish .. 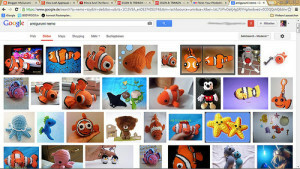 Since I wanted a Nemo, which is a specific clownfish, that already shows the typical signs of “cuteness” .. big eyes, I added Nemo to my clownfish search ..
Then I search for amigurumi that might already exist, I wouldn’t want to make something that’s already there ..
and I always take a look at dolls/toys of clownfishes ..
here I found a very good picture ..
the marked toy gives a very good picture of the overall shape of Nemo, especially the back fin was interesting to see, since it was continuous. Great to hear that you’re going to show your process. As an artist myself, I love seeing how people work. 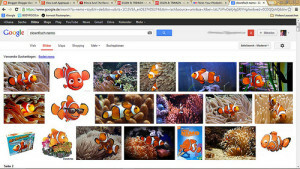 Don’t know if the Google search gave you a correct link or not, but the image you circled is a custom toy by Jason Freeny. 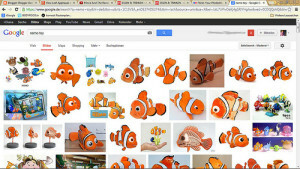 He’s got a ton of images from this Nemo toy in all angles, which I assume would be good reference for you. hi, Diana! that’s an interesting process! would like to see the result soon :)have a lovely day!